This response and continuing reports that police and street cleaners are disturbing rough sleepers in the City have angered readers (see letters) and homeless and housing groups, many of whom are concerned by the legal direction the campaign seems to be taking, following the arrest of a reader for refusing to comply with the ‘move on’ policy. On 30th May at 2.30am, police carrying out a ‘welfare check’ on Booth Lane in the City of London woke Peter Pickles, 57, and asked him to move. It was the second time he had been roused that night, and he refused. He was arrested for “obstructing/resisting a constable in execution of duty” and held for, he estimates, three or four hours before being bailed. Mr Pickles, whose 70-mile charity walk in aid of the Spitalfields Crypt Trust (reported in issue 30 of The Pavement) raised around ¬£400, appeared at the City of London Magistrates Court on 6th June. He was represented by a duty solicitor who had earlier entered the waiting room to ask if anyone needed representation. The magistrate said the incident was “out of Mr Pickles’ character” and gave him a six months’ conditional discharge with no costs, meaning that no further action will be taken against Mr Pickles, unless he commits another offence within the next six months. The magistrate also took into account that Mr Pickles was violently assaulted last year (reported in issue 20 of The Pavement). The frequent move-ons have lead to flashbacks of the attack, even though Mr Pickles says, “I find it less stressful out here [on the streets] than in a hostel”. Despite everything, Mr Pickles does not blame the police: “In a sense, I feel sorry for the police, given an order they don’t want to do.” Like many of our readers, Mr Pickles is used to receiving the pink ‘stop/search’ slips from police carrying out ‘welfare checks’. On one such slip handed out just last month, the ‘outcome’ is recorded as “moved on as per force policy Corp of London”. However, Sergeant O’Connor, of Snow Hill police station, told The Pavement that Operation Poncho will continue until further notice, and that the police are involved in “carrying out the welfare checks, checking how everybody is and facilitating cleansers carrying out their work”, the latter aspect, she said, since April or May this year. The Pavement asked Mr Sinclair, of Broadway, about the arrest of Mr Pickles. He was not aware of the case. “It wouldn’t be right for me to comment on individual cases,” he added. “It’s not something that we’re involved in or have been involved in.” Mr Pickles is not the only rough sleeper in the City who has recently had an unexpected brush with the law during this operation. A number of readers spoke about their experiences of being ‘moved on’ to The Pavement and BBC Radio 5 Live. We have since heard that less than a fortnight after speaking out, two of the six men were arrested for suspected immigration problems, despite the police having stopped them for ‘welfare checks’ numerous times before. They were released without charge. 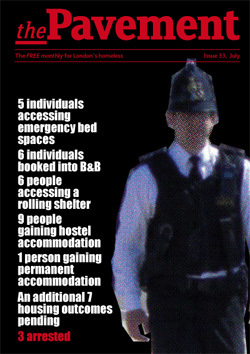 Although the Data Protection Act means that the police are unable to confirm the names of individuals who have been arrested and not charged, or comment on their cases, the City of London press bureau confirmed that on 6th June a homeless man was arrested on suspicion of overstaying his visa, and on 8th June another was arrested on suspicion of the same offence. Unfortunately, other than the coincidence of the timing of their arrest, there is no way for us to link this directly to the operation in the City. Following Mr Sinclair’s response to The Pavement and other media outlets, Broadway has now published a number of ‘positive outcomes’ they have recorded since taking on their contract in March (worth £790,682 over three years), which includes: Six individuals booked into B&B; five accessing emergency bed spaces; six people accessing a rolling shelter; nine people gaining hostel accommodation; one person gaining permanent accommodation; and an additional seven housing outcomes pending. The Pavement asked Mr Sinclair where these individuals had gone on to. He was unable to answer. “I don’t know the details of the individuals,” he said. “I don’t work with them directly, so all I would say is that those numbers here have improved.” He later added: “I don’t know of any negative follow-ups”. Mr Sinclair added: “These figures aren’t temporary, they’re figures. Some of the outcomes are temporary, as opposed to permanent. What we haven’t done is found all these people permanent accommodation ‚Äì it doesn’t work like that. But they’re not temporary outcomes. They’re outcomes.” He agreed, however, that the statistics represented a ‘snapshot’ of Broadway’s progress to date, adding “there are individual stories behind that”. The statistics supplied by Broadway also referred to a number of “wider social/healthcare outcomes” including: 11 requests for mental health assessments; two referrals into detox; five people reconnected to their local community i.e. supported to return to their country of origin, namely Poland (with a further three individuals supported from Tower Hamlets).